Koh Seung-duk has seemingly done it all. He was the first person to pass Korea’s state exams for law, public administration and diplomacy. Having spent three decades as a lawyer, while at the same time appearing on TV as a legal expert for 20 years and spending 15 years as a financial adviser, Koh became a member of the National Assembly in 2008. But the 56-year-old is not widely seen as an educator, an irony for someone seeking to become the education chief for a city of 10 million. “It’s a common misperception. I spent 10 years mentoring and advising teenagers. And when you count all those years I’ve taught at universities, my education-related work amounts to some 20 years. 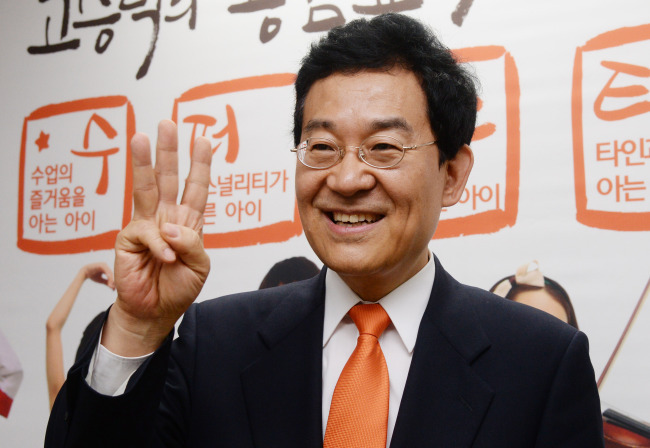 Education is an important part of my life,” said Koh, who is running for Seoul education superintendent on June 4. He said that today’s educational authorities consisted of a handful of self-styled experts that monopolize the major positions. He pointed to current Seoul education chief Moon Yong-rin, as the “Godfather” of this select group of people, who all graduated from Seoul National University with a degree in education. Koh claimed that, as an outsider, he is best suited to revamp the old system. He likened himself to Guus Hiddink, the world-renowned Dutch soccer coach who is beloved in Korea for leading the Korean national team to the semifinals of the 2002 World Cup. “When our team made the run (in 2002), it was not because we brought in players from other countries. Our players have always been there, but the coaching staff failed to play them properly. He claimed that the so-called rusty system has been holding back the students from realizing their potential. “The 21st century calls for someone who can bring together various fields of expertise. This is basically what my life has been about. I’m the only candidate who has professional experience in drawing up new policies,” he said, pointing to his four years as a lawmaker for the Grand National Party, now the ruling Saenuri Party. The former lawyer criticized the current system that picks a “solitary scholar from their ivory tower” as its chief. Traditionally, the education chief posts have been held by former professors and teachers. The parliament agreed in February that from July, all candidates for education chief must have worked in related fields for at least three years, excluding the June election. If Koh is elected, he will be a lone exception in the long line of lifelong teachers and professors. While Koh claims to have accumulated some 20 years of education-related experience, he is seen as an outsider. His conservative rival Moon flat-out called him “a stranger” in educational circles. His perceived lack of educational experience could undermine his bid, but Koh has been promoting it as an advantage. “An education chief is not someone who teaches, but someone who can encourage the teachers and students to focus on their dreams. On the whole, education is a public welfare service. This means a policy expert or CEO-type education chief are best suited for the job, not someone who has been studying by themselves at a university,” he said. Koh vowed to improve the regular schools across the country, rather than focus the city’s resources on handful of “experimental schools.” Elite schools, such as foreign language high schools, international schools and autonomous high schools, have been introduced to test new systems but have created a de facto caste system of schools and students. “We’ve had our share of experiments in education, and the teachers are saying that regular schools are paying for them,” he said. The idea behind these experimental schools was that once an appropriate system has been established, the idea will trickle down to the rest. “The reality is that few schools receive the benefits while most are denied,” Koh said. With the election just around the corner, Koh is currently holding a sizable lead over his rivals. He garnered somewhere between 20 and 30 percent approval rating, and holds a 10 percent lead over the runner-up Moon Yong-rin. But it is still too soon for Koh to get comfortable as nearly half of the respondents said they were unsure of whom they would vote for. According to a survey by the National Election Commission, over 85 percent of the constituency said they would vote in the upcoming election. While it is very unlikely the actual voting rates will be that high ― participation in the local elections in 2010 was just 54.5 percent ― the recent ferry sinking and the lackluster government response to it is expected to drive up the voting rates. Since all voters for the local elections have to also choose education chiefs for their constituency, a large chunk of the undecided votes may select their picks very close to the election, which could dictate the outcome. Elections for education chiefs generally get the least attention, as the public is often unfamiliar with the candidates. This means Koh’s level of support may derive from being easily the most well-known figure out of the prominent candidates, and the actual results could be different. Cho Hi-yeon, the sole liberal candidate, has approval ratings of under 10 percent, but left-leaning voters that account for a large portion of the undecided bloc may decide to rally behind him. The question remains whether Koh can persuade the voters that his time spent outside the classroom is actually a merit, and not a shortcoming.